The Nightwalkers are terrorizing Gotham City, and Bruce Wayne is next on their list. Bruce is turning eighteen and inheriting his family's fortune, not to mention the keys to Wayne Industries and all the tech gadgetry that he could ever desire. But on the way home from his birthday party, he makes an impulsive choice that leads to community service at Arkham Asylum, the infamous prison. There, he meets Madeleine Wallace, a brilliant killer with ties to the Nightwalkers. A girl who will speak only to Bruce. She is the mystery he must unravel, but is he convincing her to divulge her secrets--or is he feeding her the information she needs to bring Gotham City to its knees? Bruce Wayne is proof that you don't need superpowers to be a super hero, but can he survive Madeleine's tense game of intrigue and deception? MARIE LU is the author of the bestselling Warcross, the #1 New York Times bestselling series The Young Elites, and the blockbuster bestselling Legend series. Visit her at marielubooks.tumblr.com and follow her on Twitter at @Marie_Lu. 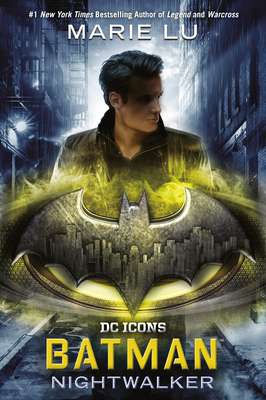 She is a DC Icons author, a series in which the DC Comics super hero icons are written by megastar young adult authors. The series also includes Wonder Woman: Warbringer by Leigh Bardugo, Catwoman: Soulstealer by Sarah J. Maas, and Superman: Dawnbreaker by Matt de la Peña.